A new Rasmussen Reports national telephone and online survey finds that 57% of Likely U.S. Voters would prefer a smaller government with fewer services and lower taxes over a larger, more active government with more services and higher taxes. That’s up from 52% in March, the lowest level in regular surveying since late 2006. This finding is still down from 61% in February of last year, but is generally more in line with earlier surveys. A new Rasmussen Reports national telephone and online survey finds that 52% of Likely U.S. Voters agree with Reagan’s statement that government is the problem, while 33% disagree. Sixteen percent (16%) are not sure. Reagan’s name was not mentioned in the question. Voters have long believed there’s a natural tension between government power and individual freedom, but while most still think there’s too much government power, they’re less inclined to say so than in the past. While polls conclude that a majority of U.S. voters still think smaller government is better than bigger government; that an overly powerful government is more dangerous than a less powerful one; and that government is the problem, not the solution; polls also conclude that U.S. voters are less inclined to say so than in the past. This seems to indicate that a healthy distrust of state power is eroding, and more people are getting used to being dominated and seeing it as a good thing. In this trend, why would we not open up all borders in still-relatively liberty-inclined countries, for more government-power inclined immigrants to come in and seal the deal in favor of the state? The state as of yet does not have a majority of voters urging it to bring down its iron fist even more. So let’s tip the balance in favor of Leviathan by pretending that “freedom of movement” for millions of non-libertarians (who favor more state, more egalitarianism-based laws, more regulations, more taxes, higher minimum wage, more government hand-outs, more state-encouraged violation of property rights, etc.) is the wonderfully libertarian thing to do. 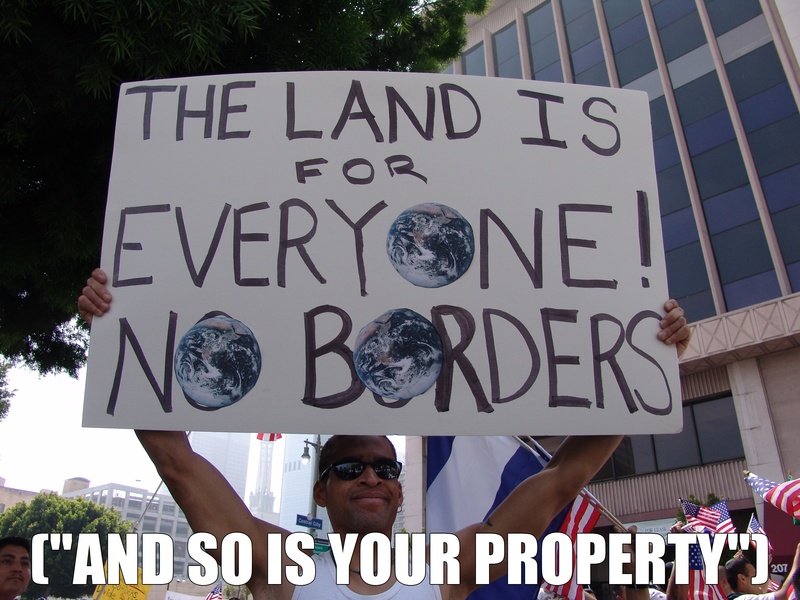 Sure, we need a bit more government to control the borders. But it’s not like we need even more ~ much more ~ government than that to give all new-comers their European style welfare state or anything. What’s that annoying little lazy mockery of those with different views? P.S. I’m sure whatever Austrian libertarians there are, are just going to absolutely love their society of non-aggression and private property rights with such examplar execution of supposed libertarian “principles” of open borders. But hey, it’s not about reality; it’s about purity man!